Instantly improve your posture while relieving strain and pain on your back and neck. This extremely comfy everyday cami bra is the perfect combination of support, compression, and comfort, thanks to its innovative materials. It has thermafused criss-cross support bands made of double-layered DuraFit® to keep your posture perfect throughout the day. 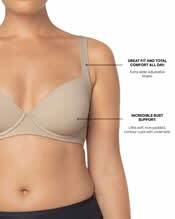 Single-layered DuraFit® fabric on the rest of the bra provides excellent coverage for your underarms, underbust and back to smooth your shape. Adjustable straps and non-padded, underwire, ultra-soft contour cups provide incredible bust support and a great shape. Perfect for all-day, every day wear! So comfy, you'll hardly notice you have it on. Sports and exercise! No matter what you do, this bra offers the bust support you seek.